A few weeks ago I showed what a bare-bones publication of a cuneiform text looks like. A much newer book is a good example of a lavish edition. 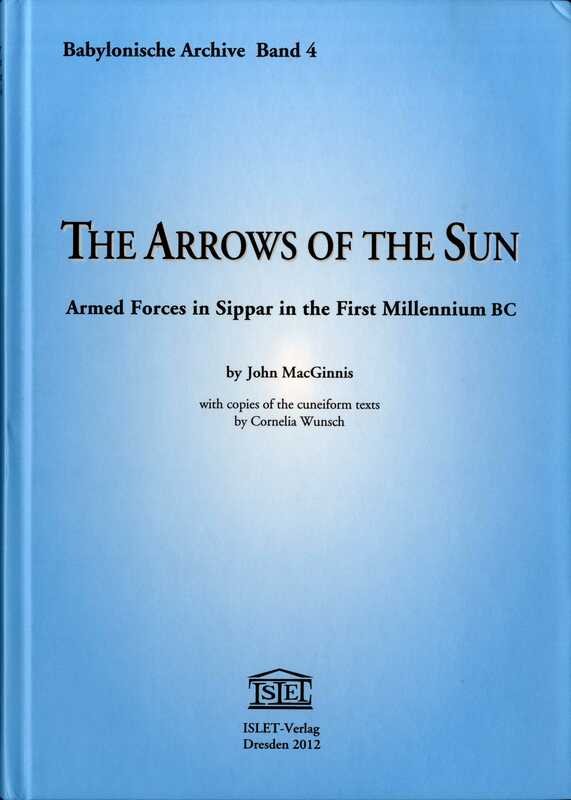 John MacGinnis and Cornelia Wunsch, Arrows of the Sun: Armed Forces in Sippar in the First Millenium BC. Babylonische Archive Band 4. ISLET-Verlag: Dresden, 2012. MacGinnis furnished his edition with eleven indices and fifty pages of discussion of war and military institutions in Babylonia in the first millennium BCE. Each text is published with sketch, transcription, translation, and commentary. 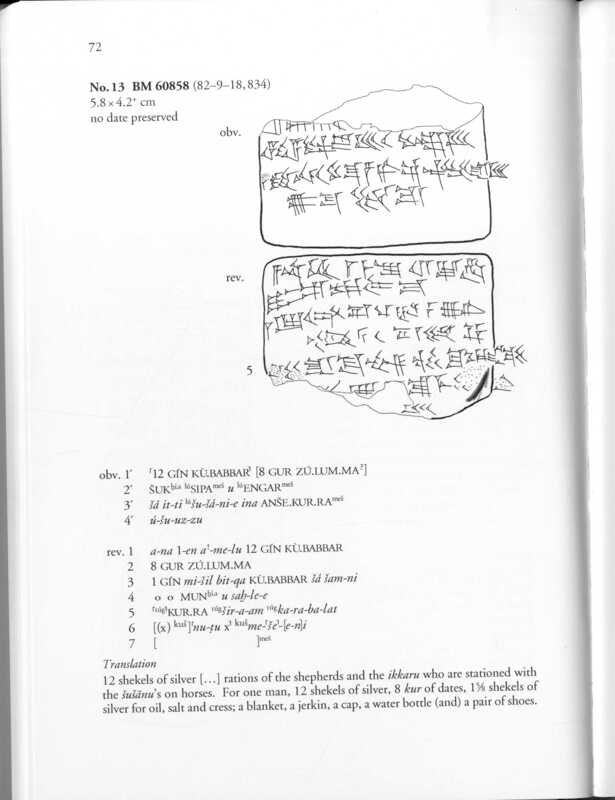 The sketch at the top lets a reader who knows cuneiform decide what signs might belong in the missing sections and whether the editor has identified the signs correctly. It also provides a backup in case the original tablet is lost or damaged, and allows tablets in different libraries to be compared. The transcription in Latin letters gives the editor’s considered opinion on how the signs should be read. Because most cuneiform signs can be read in several ways, and words are not always separated, a transcription is an interpretation. That is especially the case for this tablet, which is damaged and written in equal numbers of logograms (CAPITAL LETTERS) and phonograms (lowercase letters). The translation makes the text available to a wider audience, but is even more an act of interpretation. In this case, the editor spent a long time pondering how to interpret the groups of signs which he translates as “jerkin” or leaves untranslated. Whereas Strassmaier’s editions are designed for the few dozen people in a given decade who are experts in Late Babylonian and its script, MacGinnis’ have something to offer anyone with a few years of college, and should be straightforward for anyone with a few years of cuneiform to read. On the other hand, providing all of these resources requires the editors to read every tablet carefully, commit to a transcription, gather names and logograms and cross-references, and research the institutions which the tablets reflect. All of these things cost time and money. Whereas Inschriften von Darius, Κönig von Babylon contains 579 tablets, Arrows of the Sun contains 54. With hundreds of thousands of unpublished tablets waiting in museum archives, Assyriologists have to make hard choices about whether to publish as many new texts as possible or to make it easier to understand existing ones.